HTC's Bolt for Sprint is a larger, more grown-up version of the HTC 10. It pairs HTC's high-quality hardware with Android 7 Nougat and Sense UI for a flexible, powerful combo. Here is Phonescoop's full review of HTC's latest smartphone. The Bolt from HTC is essentially a larger version of the HTC 10 with some updated specs. The Bolt carries over the 10's design and software, but ramps up the internals in order to improve its raw power quotient. If you're a Sprint customer looking for a solid piece of HTC hardware and prefer bigger phones, the Bolt might strike your heart. The Bolt is a bit of a curiosity in that it's a rare exclusive for Sprint. The country's fourth-largest carrier is banking on some color-matched marketing between its own yellow branding and the yellow jersey favored by Jamaica's gold-medal-winning "sprinter" (get it?) Usain Bolt. Marketing message aside, the HTC Bolt is a fine piece of hardware from HTC that aims for the phablet lovers among us. HTC is known for its aluminum unibody designs and the Bolt is another handset to rely on that basic approach. If the HTC A9 and HTC 10 got married, had a kid, and that kid outgrew both its parents, you'd get the Bolt. The Bolt has the flatter shape of the A9 with the 10's key design characteristics. It's a good mix of both parents. The Bolt comes in glacial silver with white glass and gunmetal gray with black glass. The brushed aluminum finish is attractive no matter which color you pick. The Bolt is smooth and angled all at the same time. It has rounded corners, but a flat rear surface and dramatically cut chamfers where the rear surface joins the side edge. The rear chamfer is so thick you might just say the rear panel is slanted toward the side. This design element comes directly from the HTC 10. The front edge of the metal chassis, where it meets the glass, has a less-dramatic chamfer. 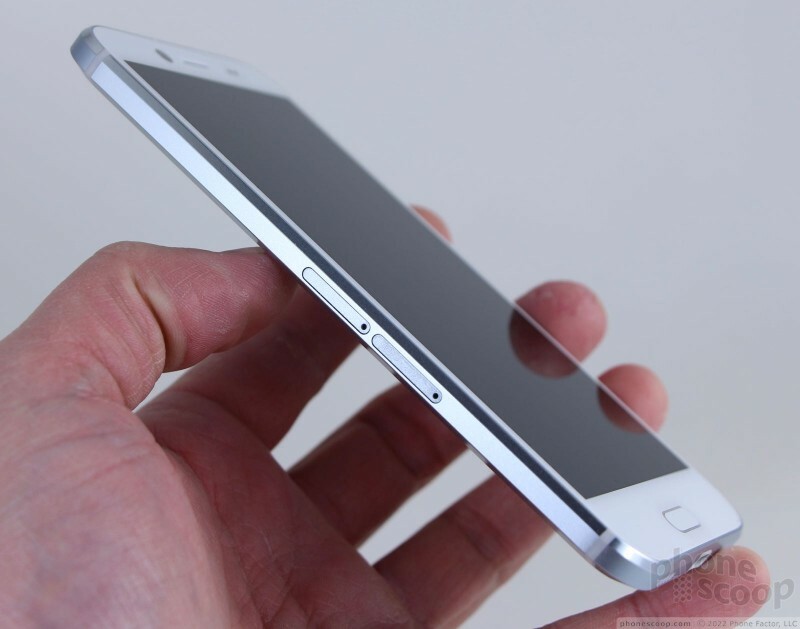 Like many high-end phones, the glass is curved slightly where it meets the metal frame. This helps keep the front edge from digging into your skin. The Bolt is one of the bigger handsets we've seen from HTC lately. It's just a hair smaller than Apple's over-sized iPhone 7 Plus flagship. With measurements that stretch beyond 6 inches tall and 3 inches wide, the Bolt is a full-sized handset for sure. The sharp edges along the chamfers don't help improve the phone's in-hand comfort. The size will surely mandate the use of two hands by many owners. My thumb can only reach about half the screen unless I begin to juggle a bit. The Bolt slips into pockets easily, though its weight means you're always aware of its presence. 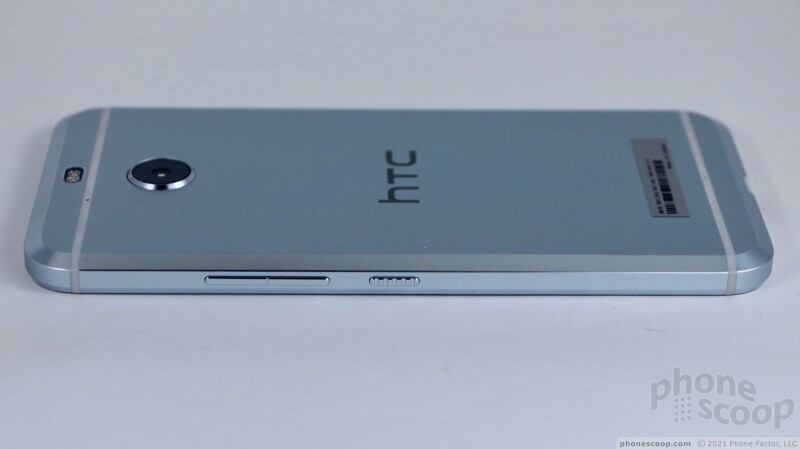 HTC selected a fine set of materials for the Bolt. The metal and glass outer components are of high quality and assembled tightly. HTC has long made excellent hardware and the Bolt is no exception. The phone feels significant and strong. 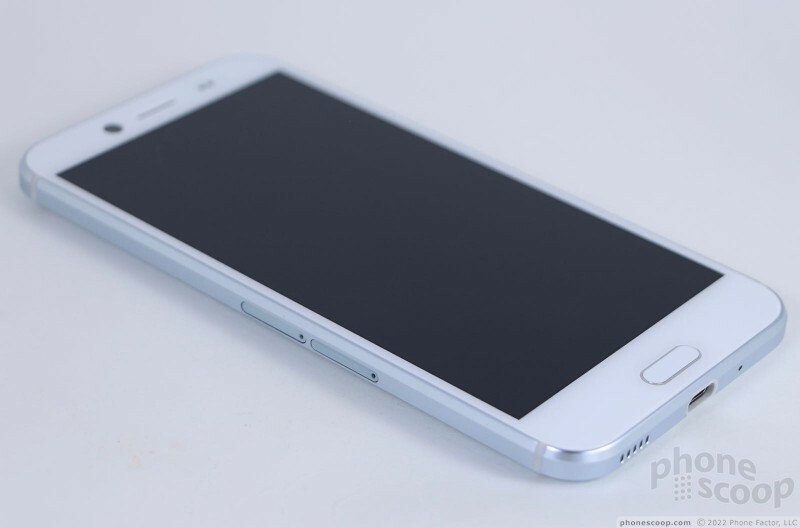 It easily matches the best efforts from Apple, Samsung, and others. The Bolt's front face is very similar to that of the A9. I can't ooh and ahh enough about how well the glass face fits into the metal frame, and yet HTC could have done a better job with the bezels. The screen measures 5.5 inches across the diagonal and the bezels are nearly as thick and ungainly as those of the iPhone 7 Plus. We tested the silver color, so some functional elements are more visible than they are on the black model. For example, you'll see a slit in the glass above the display for the earpiece speaker and the large selfie camera off to the left. There are two small sensors to the right, as well as a very small (but still visible) microphone hole. An elliptical fingerprint sensor sits below the screen. It's set apart visually thanks to a thin chrome rim. The sensor is indented just a small bit, which makes it easy to find by feel. It doubles as a capacitive home button and is flanked by two other controls: the back button on the left and the app switcher on the right. All three of these buttons work well. There are two trays on the left edge: one for the SIM card and one for the memory card. They both require tools to eject, but are otherwise simple to interact with. The phone supports microSD cards with capacities up to 2 TB. The screen lock button and volume toggle are both on the right side of the phone. The lock button, located dead center, has a coarsely-ribbed edge that makes it feel completely different than the volume toggle. The volume toggle is long and smooth. Both buttons have excellent travel and feedback. 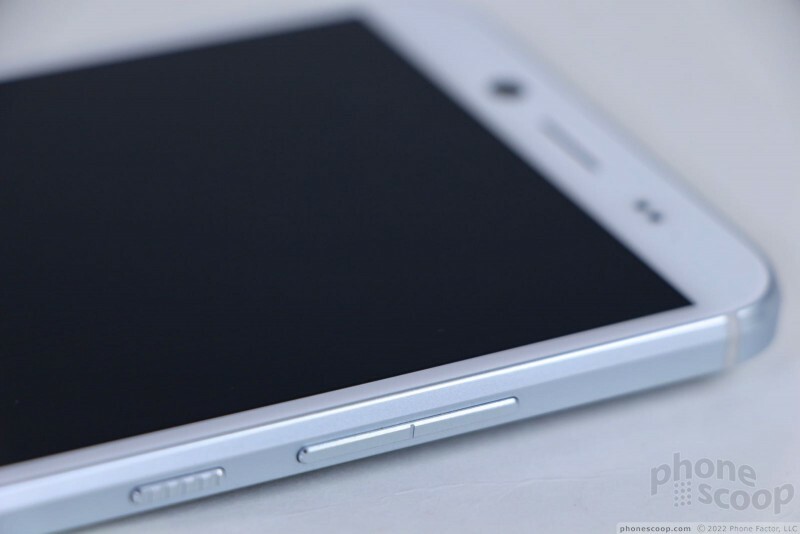 The phone's top edge has a polycarbonate panel fitted into the frame. 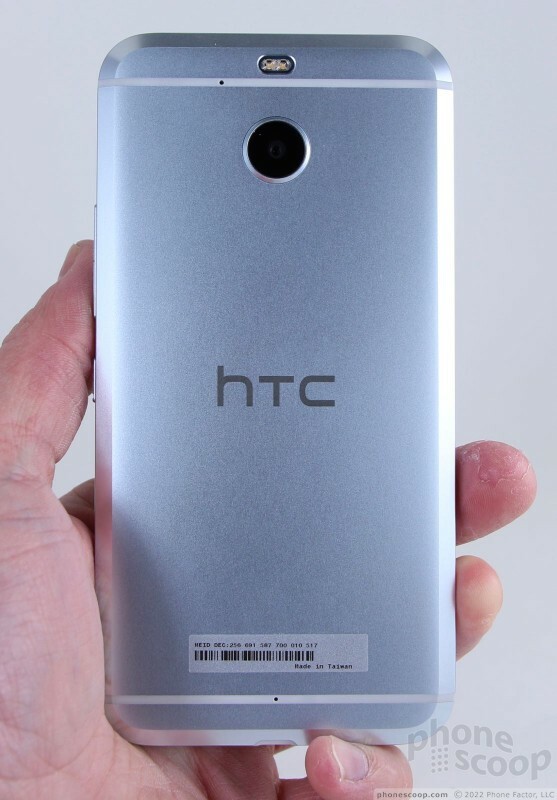 It looks almost identical to the similar panel on the HTC 10. The panel allows for wireless signals such as GPS to pass through. The polycarbonate is white on the silver model and dark gray on the gunmetal model. You won't find a headset jack up here, nor will you find one on the bottom edge. 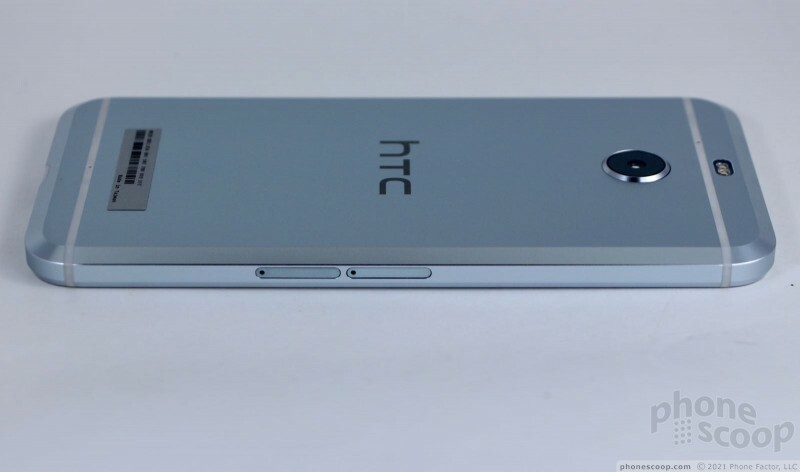 HTC is following the path forged by Motorola and Apple by ditching the headphone jack. 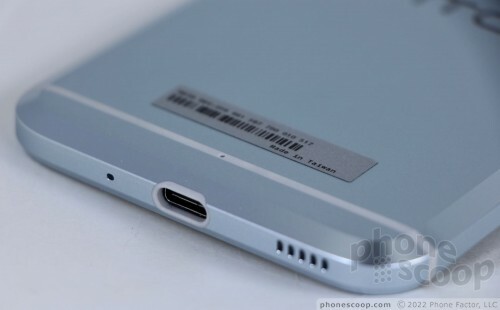 The bottom edge holds the USB-C port, speaker, and a microphone. Unlike the 10, the Bolt's rear panel is mostly flat. I like the look, which I think works well with the thick chamfers. The 10's curved shape makes it easier to hold, but the Bolt's shape means it won't wobble on flat surfaces like tables or desks. The camera module, placed dead-center near the top, is a small raised circle with a chrome rim. 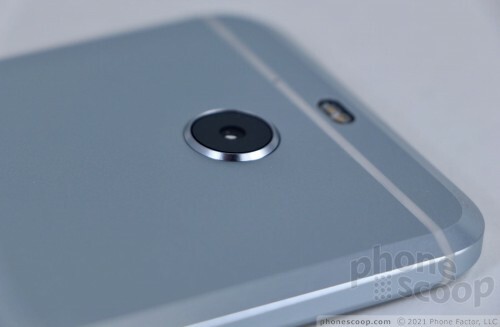 HTC pushed the dual-LED flash nearly to the top edge of the phone, which is very unusual. As you might have guessed, the unibody chassis is sealed up tight and the battery is inaccessible. Last, the Bolt is certified IP57 for protection against dust and water. 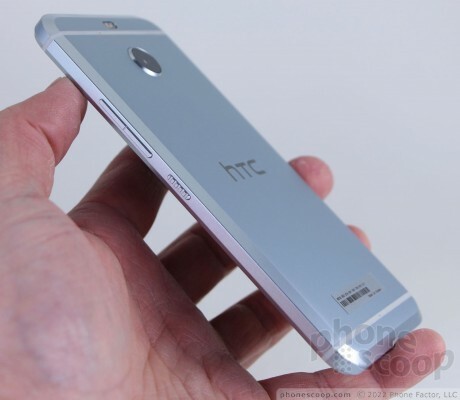 That makes it the first water-resistant unibody metal handset from HTC. The phone easily brushed off running water and short dunk in a full sink. This is a welcome addition to HTC's lineup, indeed. The Bolt is a really solid phone. My only complaint is that I wish the bezels were narrower all around. Otherwise, you can't ask for a finer bit of metal and glass. 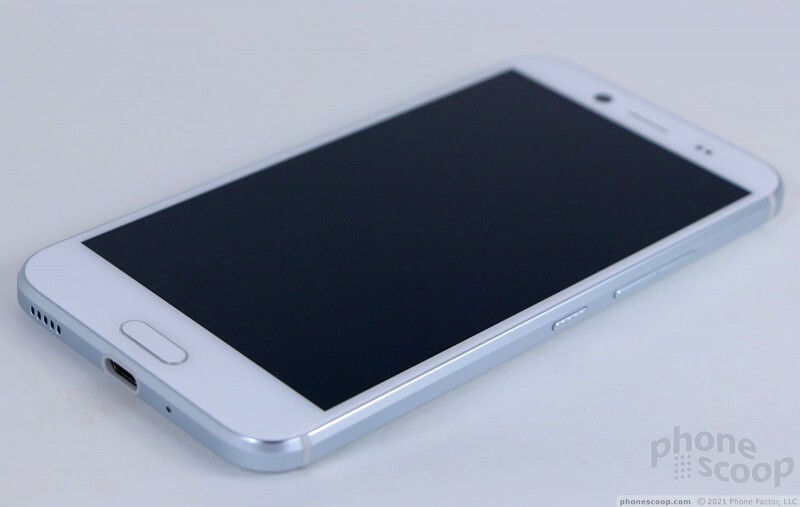 The 5.5-inch display boasts quad HD resolution, which is great. The Super LCD 3 panel is sharp, bright, and colorful. On-screen elements are incredibly sharp and detailed. Your eyes won't spot any individual pixels anywhere. HD video looks really good on the display, and VR content works well (as long as you have a viewer that will accommodate the Bolt's large footprint.) Brightness is quite good. I was mostly pleased with indoor and outdoor visibility, though direct sunlight did sometimes obscure the display. HTC's LCD panels are always very accurate as far as color is concerned and that's no different here. Viewing angles aren't the absolute best I've seen, but there's no blue shift and only minimal brightness loss. The Bolt has a very good screen. The 3xCA power means the Bolt can bundle together three separate LTE spectrum bands for faster speed and throughout. Theoretical max speeds of 3xCA in the lab reach 450 Mbps. Sprint claims that users will experience peak downloads of about 300 Mbps in the real world. Right now, 3xCA is available in Atlanta, Chicago, San Francisco, Minneapolis, Dallas, Denver, Kansas City, Cleveland, and Columbus. The company has just started deploying 3xCA in NYC, but it hasn't said when NYC will be fully and/or officially covered by 3xCA. Unfortunately, we weren't able to test this particular aspect of the Bolt's wireless performance. Our review unit still did an excellent job connecting to Sprint's LTE network in and around NYC. 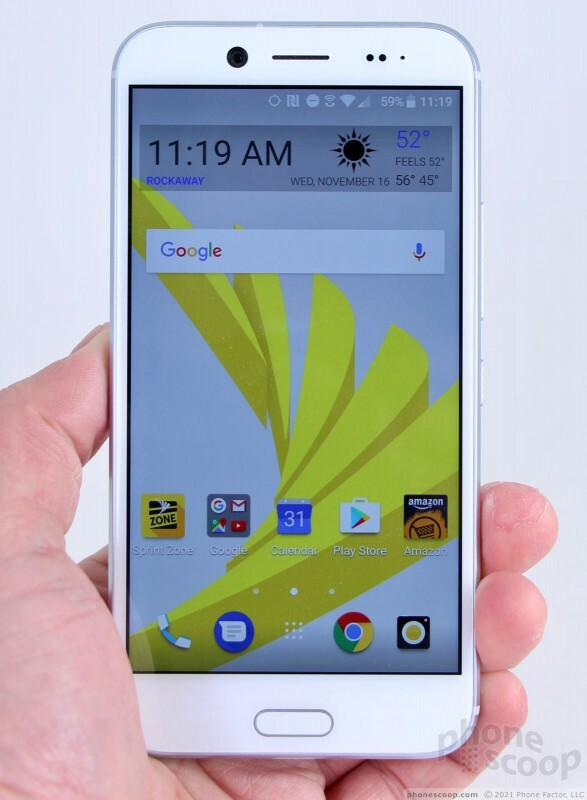 The phone did not drop Sprint's 4G signal at all and never dipped to Sprint's legacy 3G network. The phone connected all calls on the first attempt and didn't miss nor drop any calls, even at highway speeds. The Bolt also supports 2xCA LTE, which is widely available across Sprint's 4G network. That means even if it's not taking advantage of the absolute newest iteration of LTE, the Bolt is still able to deliver excellent data performance. I saw peak speeds hit 75 Mbps, which is plenty fast enough for checking email, browsing the web, streaming YouTube videos, and catching up on Instagram. Phone calls passed over Sprint's wireless network are just short of excellent. The earpiece pumps out plenty of sound, allowing calls to be heard in most environments you care to take the Bolt. Clarity could be a little bit better, as the earpiece will distort somewhat with the volume all the way up. The same is true of the speakerphone, which produces a huge amount of noise. I found it distorted more than the earpiece, but I've heard worse. The Bolt also supports calls over WiFi. Calls passed over my home wireless network were clearer than those made over Sprint's wireless network, with volume remaining unchanged. WiFi calls were basically awesome. Those I spoke to via cellular and WiFi connections said I sounded good. The Bolt's lone speaker blasts ringtones and alerts at eardrum-popping volumes. The vibrate alert is particularly strong. The Bolt drops HTC's traditional BoomSound stereo speakers. The bottom-mounted speaker is the only loudspeaker. In its place, HTC is pitching BoomSound Adaptive Audio headphones with special software. The headphones are able to create an audio profile that's unique to each user based on the shape and depth of their ear canal. The software is also able to adjust a bit to the surrounding environment, but there is no active noise cancellation or anything like that. 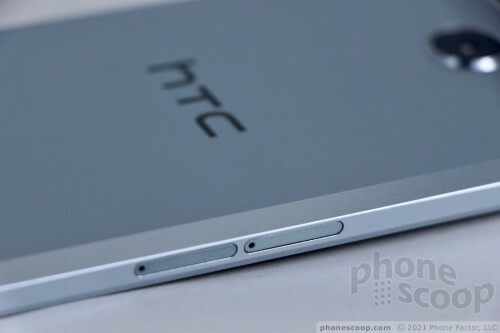 The result, says HTC, is an accurate EQ that delivers optimized sound for everyone. 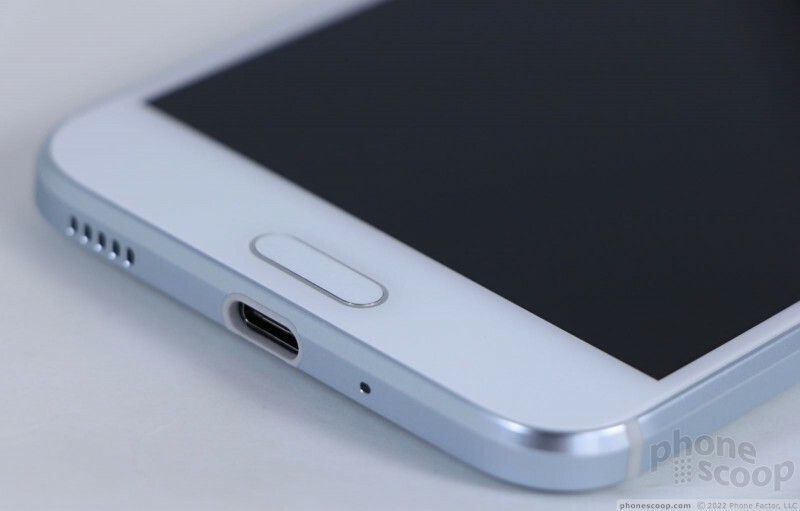 It's important to note that the included headphones rely on the USB-C connector, and that's how HTC is able to do this. The headphones have microphones that listen to the sound within your ear and deliver the needed feedback to the software. The BoomSound Adaptive Audio only works with the included headphones. 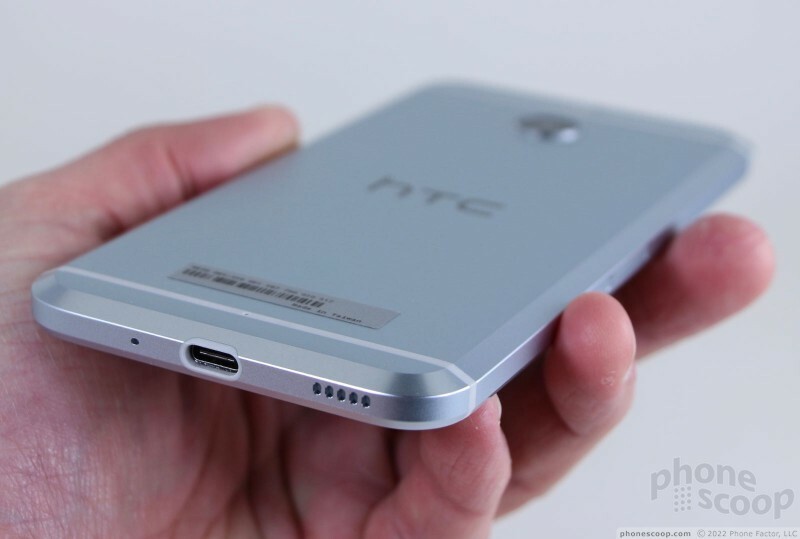 HTC is not including a USB-C-to-3.5mm adapter in the box initially, as it is not yet ready. HTC expects to include the adapter in the box starting in December. HTC said, "Customers who purchase now and need the adapter can call HTC to have one shipped to them free of charge as soon as it's available." The included earbuds — together with BoomSound Adaptive Audio — deliver a really good music experience. I was surprised with how balanced the sound is. Personally, I'd probably adjust the EQ curve differently myself, but when compared with every other set of in-box earbuds on my desk, the HTC's sounded the best by a wide margin. The Bolt has a 3,200 mAh battery, which is about what you'd expect for this class of device. 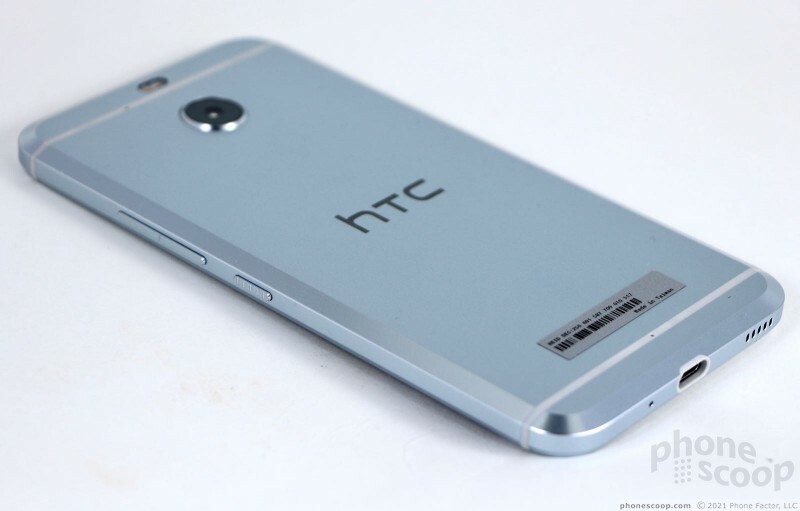 HTC claims the battery will provide more than a single day of normal use between charges. That claim is accurate. I was able to push the phone from breakfast one day through lunch the following day on several occasions. That's better than most phones. My guess is the majority of owners will see at least full day from the HTC Bolt with some power to spare. 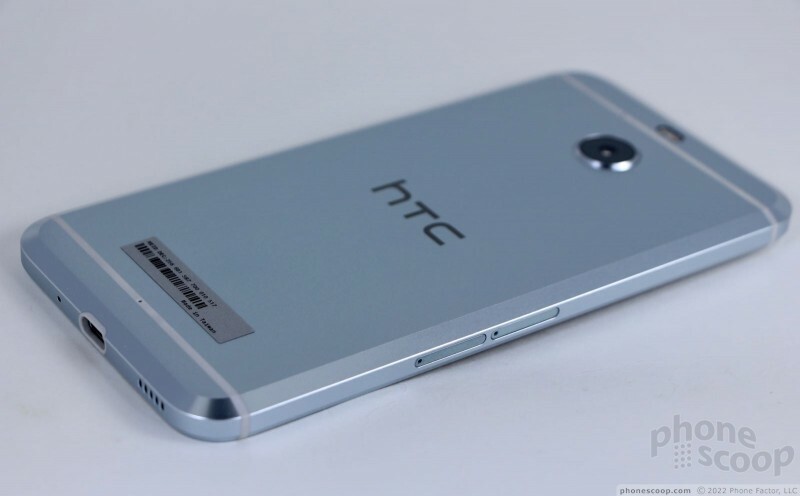 The phone includes HTC's Power Saver mode, which can be set to come on when the battery reaches a predefined level. Power Saver conserves CPU cycles, limits location services, reduces screen brightness, and turns off vibration. When I turned Power Saver on, the available battery life typically improved by at least a few hours. The Ultra Power Saver mode is more dramatic; it basically puts the phone into “2001” mode, which means the phone, messaging, and email apps run, but nothing else. This can add up to a day of life to a nearly depleted battery. The Bolt cannot charge wirelessly. 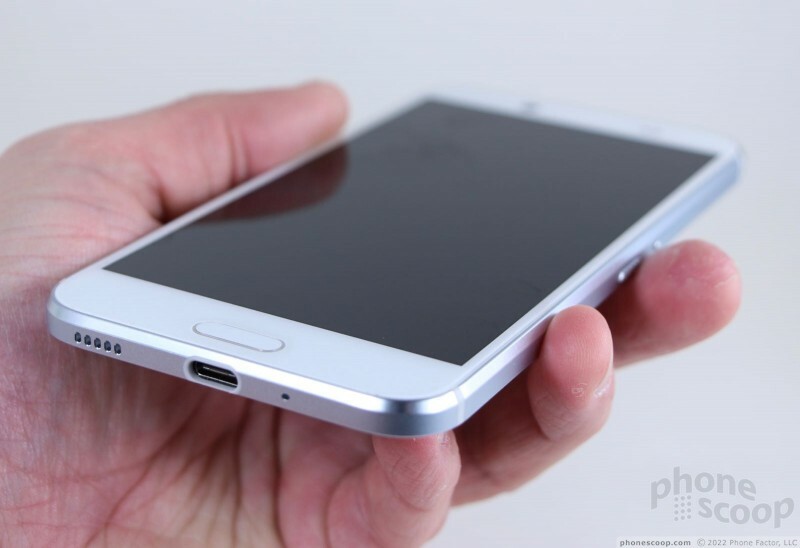 However, the Snapdragon 810 processor supports Quick Charge 2.0. HTC was kind enough to stick a QC2 charger in the box with the phone. All of the Bolt's secondary radios functioned perfectly. Bluetooth worked very well and quickly paired with headphones, headsets, and my car. Call quality was above average when used with a standard Bluetooth headset and my car's hands-free system. Music sounded very, good when pushed to a good pair Bluetooth headphones. GPS performed flawlessly with Google Maps. The Bolt located me in an instant and accuracy was often as good as 10 or 15 feet. The phone worked well as a navigation device between points, and displayed my location in perfect sync as I drove around. The NFC radio helped pair the Bolt with some of my Bluetooth accessories, and it supports Android Pay for mobile payments. The WiFi was incredibly speedy. The HTC Bolt is a mishmash of HTC's two best phones with a handful of unique features tossed in to give it some additional appeal. Under-the-hood specs such as three-channel carrier aggregation and a Snapdragon 810 push this unibody handset faster than many others.